Join us (and 14 other Spring Mountain District wineries) on Sunday, November 18 from 4:00 until 7:00 p.m. for a celebration of harvest and walk-around tasting. We will be at the Presidio Golden Gate Club, 135 Fisher Loop in San Francisco. This is an unusual opportunity to taste a number of wines from our appellation, all in one place, without having to get in your car! All of the wineries will be pouring current releases, library wines and a surprise or two. Look forward to seeing you in San Francisco. P.S. Keep up with the harvest on Spring Mountain. Read Stu’s 2018 Harvest Reports. The Spring Mountain District appellation, established in 1993, lies above the town of St. Helena on the eastern slopes of the Mayacamas Mountains. 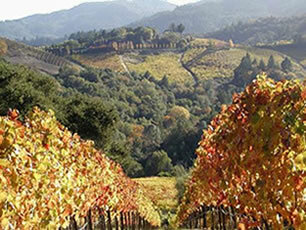 Encompassed within its bounds are about 8,600 acres, of which about 1,000 are planted to vineyards. Previous Previous post: Congrats to Roberson! Next Next post: Going strong!